Today is Mixology Monday 11 and the theme is Winter Warmers. The good folks at Imbibe Unfiltered (the blog for Imbibe Magazine) are hosting this month’s event. The drink I’m referring to is The Beautiful. You don’t too often see it listed on menus, although most places on the coasts know how to make them. And it is actually one drink that I don’t mind telling a bartender how to make if he doesn’t know it because it is so simple. 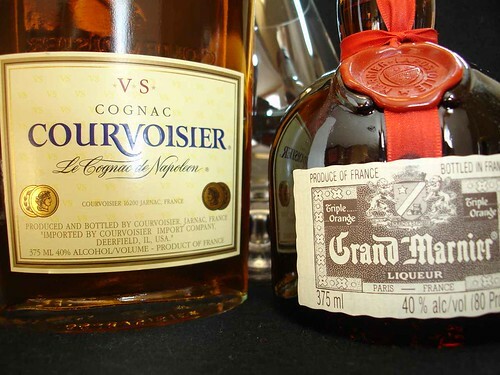 The Beautiful is simply 1:1 Grand Marnier to Courvoisier. Generally it is served in a brandy snifter, although one of my Spirit World co-writers has complaints about brandy snifters. He also complains about heating brandy but I’m going to suggest you do it anyway! I’m such a rebel! Actually, while I understand his points I think you just need to learn how to sip these beautiful beverages. He complains that the glass (and this is even more when heated) concentrates the fumes so much that you are nearly knocked out and your nose singed when you go to take a sip. And, yes, if you inhale deeply just as your nose reaches the glass the experience can be rather unpleasant. However, if you slightly inhale as your nose approaches the glass the heated essence you encounter is just a glimpse into the wonderful flavors that await. Also, instead of heating this drink over flame I prefer to use the method most establishments do. Fill an old-fashioned glass with hot (almost boiling) water, then place the snifter on it’s side with the snifter just touching the water in the glass. Then you slowly turn the snifter, gently heating the glass on all sides and as a result also warming the golden liquid within. This drink is perfect après ski, sitting in front of a cozy fire in your own home, as a chill fighter if you’ve been out running errands in the winter weather and decide to pop into your local establishment. And because it is so easy it truly can be a relaxing end to a long day. So give The Beautiful a try and your world will soon be…. beautiful.